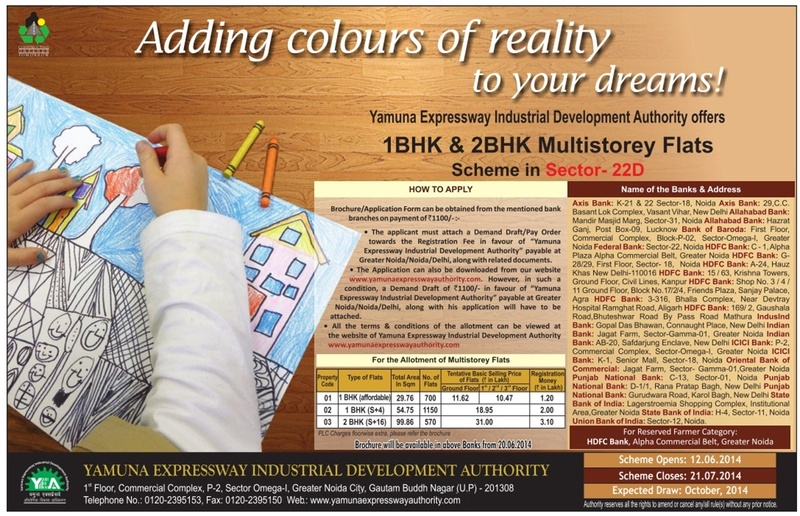 Yamuna Expressway Industrial Development Authority (YEIDA) is offering 1 and 2 BHKs Multistoried apartments in Sector 22D of Yamuna Expressway under BHS – 03/2014 schemes. The scheme is from Yamuna Expressway Industrial Development Authority (YEIDA), so you can be positive that the land and flat would be free of litigation and built as per Government building laws. No problems of completion certificates or adverse surprises after you move in. There are around 2,000 flats for general public (unreserved). So you might have a better chance of allotment than other authorities’ schemes. Why you should not apply? As of today the Yamuna Expressway area is not populated and so you might find it difficult to live there. The application form can be downloaded from Yamuna Express Authority Website. You would need to attach additional draft of Rs 1,100 along with registration money. Also the application form can be bought from authorized bank branches. The list of authorized bank branches can be found in the advertisement below. Draw for the flats number of BHS-03/2014 was held on 26.02.2019 in Authority Sector-P2,Greater Noida. How can i see the result of the same, please update. I have been allotted 1 BHK (S+4) in the Scheme BHS-03/2014, under property code 02. Can you please share the status of these flats, as we are paying installments under E2 plan from past 5yrs but didn’t get any information from authority via mail or letters apart from allotment letter. Looking forward to hear from you. Thank you!! What is the current price of registry and lease deed of YEIDA Sec 22D Affordable Housing Flats. please send me our latest status…. Needs to join the forum on getting latest updates on BHS 03/2014 scheme. I have also been alloted a 2BHK flat under this scheme and first installment out of sixteen has been paid. Anyone knows the status of this scheme at present? I have alloted a 2bhk flat 99.84 sqm under bhs 03/2014 scheme. Can I take or surrender it?. Give ur views. As per my view, you can sold it out as now a days residential properties are no longer a good option for investment. You can opt for commercial properties which guarantees you assured return and life time lease guarantee income. what date of draw for bhs3/2014 sector 22D flats scheme. please send me on my email.